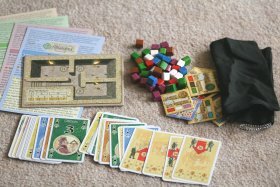 And again, there is another expansion for Alhambra. 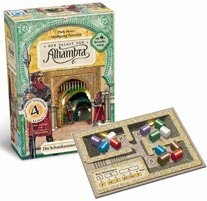 Die Schatzkammer des Kalifen is already the fourth one and by degrees Alhambra develops to a complex game with many possibilities to vary the game. As always, Die Schatzkammer des Kalifen can be mixed with the other expansions. This time the changes to the original game are quite remarkable and can change the game enormously, a fact which is due to massive changes in the scoring mechanism. The first variant is Die Baumeister ("architect") and is a smaller one. Architects are mixed in with the money cards and can be drawn instead of money. During the game they have two functions. First they can be taken as money with no changes to the normal money rules (they have a specific colour too). The second possibility is to take them for an additional turn to rebuild the Alhambra, which strengthens this often forgotten possibility in the game. With this choice the player does not "loose" a complete turn for rearranging his Alhambra. With the expansion Die Bazare ("bazaar") a new type of building comes into the game. Once a bazaar is drawn, it is placed next to the normal buildings and can be bought instead of a this building. Bazaars can only be bought with the exact amount of money (of course this gives the player the possibility to buy another building). They are placed in an Alhambra like the other buildings and give additional victory points (in the last scoring phase), depending on the number of neighbouring buildings that fit in colour to the specific three colours of the Bazaar. The next variant is called Die Angreifer ("attacker") and is an interesting one. While in the normal course of play the players only can acquire victory points, this new variant will often result in a loss of points. After each scoring phase a special attacker card is drawn. This card shows from which side the attackers try to ambush the Alhambras. For every building on this side of the Alhambra without a sheltering wall a player will loose one victory point in the first scoring, two in the second one and three in the last one. To give the players a chance to get to know from which side an attacker will ambush, there is the possibility to use a special scout card by buying a building, which fits to the colour and type of the scout. The last new variant is called Die Schatzkammer ("treasure chamber") and gives the players a new possibility to act in their turn. At the beginning of the game, 4 treasures chests are placed within each of the three chambers of a specific treasure card. For the amount of eight (or more) money the player can buy the content of one of these chambers. He then places the treasures in buildings of the same colour as the treasures in his Alhambra. But only one treasure per building is allowed. So treasures that are left are passed clockwise to the next player, who then can place these treasures in his buildings. At the end of each scoring phase the player with the most (the second and the third most) treasures will get extra victory points. The newest expansion Die Schatzkammer des Kalifen gives the game some new aspects. Especially the attackers will influence the game significantly and one should be careful to include this variant when teaching Alhambra to new players. As I said in one of my former reviews of an Alhambra expansion, I would suggest a maximum of 2-3 variants in a game. So with four expansions, each consisting of four variants, there is now a wide variety to change the game. As a real fan of Alhambra, you surely should have all of them. For the rest of you, there is now a new expansion to choose from. In my opinion, this new expansion surely is one a better one, due to the big influences in the scoring mechanism of the game. But probably this is a very subjective, personal view. In the end I am anxious to know how many more expansions Queen Games still will publish in the next years.